Venezuela International Visitor leadership Program (IVLP) alumna Daniela Ropero is taking a stand on gender-based violence. Before her exchange program on law enforcement and community policing in July 2015, she focused her work on community security as well as women's empowerment. Daniela participated in the creation of a municipal project called “Observatorio Metropolitano de Seguridad Ciudadana” (Metropolitan Observatory of Citizen Security), which studied trends of barrio, or neighborhood, violence. She was also a leader within "Voluntad Popular Mujeres," an initiative to engage women and develop policy with mothers in mind. 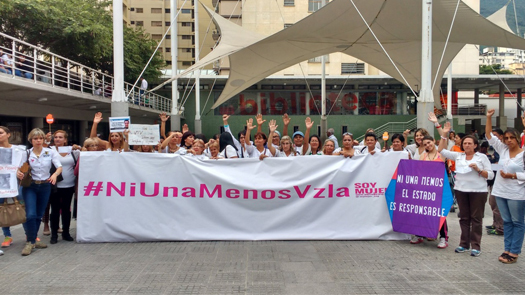 “Soy Mujer” advocates for women’s rights and empowerment and is taking part in the continent-wide campaign “Ni Una Menos” (#NotOneWomanLess) for gender violence prevention. In commemoration of the International Day for the Elimination of Violence against Women on November 25, Daniela and her organization designed an artistic intervention in the popular Plaza Los Palos Grandes of Chacao municipality in Caracas, after launching a campaign on social media using the hashtag #NiUnaMenosVzla with the participation of many local celebrities, athletes, and prominent citizens. They also participated in the Walk of Memory, a walk in absolute silence until it was broken by the saying the names and the ages of Venezuelan victims of femicide during the current and past year, and the testimonies of the victim’s relatives who raise their voices to create public awareness and mobilize Venezuelans to bring about change.